Skin is the biggest organ of our body. It isolates the interior body part and shields from microscopic organisms and infections and manages body temperature. Some normal yet imperative skin issues are as per the following. Skin inflammation is a skin condition that happens when your hair follicles end up plainly stopped with oil and dead skin cells. Skin inflammation most usually shows up all over, neck, trunk, back and bears. Skin inflammation can be upsetting and annoyingly tireless. Skin break out sores mend gradually, and when one starts to determine, others appear to manifest. Whiteheads: stay under the skin and are little. Blackheads: unmistakably noticeable, they are dark and show up on the surface of the skin. Keep in mind that a pimple is not created by soil. Scouring your face energetically when you see clogged pores won't offer assistance. Papules: which are unmistakable on the surface of the skin and are little knocks, typically pink. Pustules: Pustules that are red at their base and have discharge at the top. Nodules: They are vast and strong pimples. They are agonizing and are inserted somewhere down in the skin. Cysts : They are agonizing, and are loaded with discharge and these can without much of a stretch cause scars. Admission of broiled and garbage nourishments. Proper sleep (at least 6-7 hours) at night. Wash face with luke warm water at least thrice a day. Intake of fresh fruits like guava, apple, pear. Reduce spicy, sour, fired foods. Reduce yogurt, coffee, vinegar, cheese. Avoid pricking or touching acne area repeatedly. Avoid sleeping with makeup and oil based moisturizer. Avoid dandruff and maintain hygiene. Cut out fats and take vegetables in plenty. Dermatitis is such a typical condition, to the point that it influences each one of five youngsters amid their school-going age. It is additionally an extremely normal illness found in newborn children. Dermatitis in grown-ups could be a repeating interminable condition, which the individual may need to live with all through life. Consequently, one might say that dermatitis is a standout amongst the most pervasive skin issues on the planet today. Skin inflammation is dermatitis, i.e. an irritation of the upper layers of the skin known as the epidermis. Skin inflammation is a bothersome condition, which prompts red rashes when scratched. In present day medicinal science skin inflammation is portrayed of various sorts as indicated by their causes and the manifestations. Atopic Eczema: commonest sort of dermatitis. This skin inflammation is created because of unfavorably susceptible responses. Hypersensitive Contact Dermatitis: because of consistent physical contact of allergen. Xerotic Eczema: because of steady dryness of the skin. Gravitational Eczema: because of flow issues, for example, varicose veins. Skin Treatment in Pune provides treatment on all types’ eczema like vata dosha type, pitta dosha type, kapha dosha type also provides ayurvedic treatment for that. Vata dosha type: When the vitiation of the vata dosha produces the dermatitis, it is felt in the dryness of the skin. There is torment and serious tingling of the influenced locale. Pitta dosha type: Pitta dosha vitiation can bring about overflowing from the influenced part. There are different side effects demonstrated, for example, consuming and fever. Kapha dosha type: When there is an irregularity of the kapha, it is more recognizable on the skin. The skin turns out to be thick and is joined by overflowing and tingling. Hives, otherwise called urticaria, influences around 20 percent of individuals sooner or later amid their lives. It can be activated by numerous substances or circumstances and generally begins as a bothersome fix of skin that transforms into swollen red welts. The tingling might be gentle to serious. Scratching, mixed refreshments, practice and passionate anxiety may exacerbate the tingling. 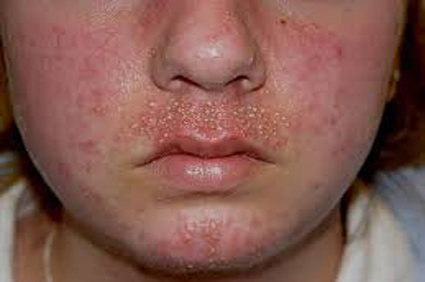 Impetigo is a bacterial skin disease. It causes red bruises that can tear open, overflow liquid, and build up a yellow-dark colored hull. These bruises can happen anyplace on the body. Impetigo camera.gif is a standout amongst the most widely recognized skin diseases in youngsters. It can happen in grown-ups yet is seen much more frequently in youngsters. Impetigo is infectious and can be spread to others through close contact or by sharing towels, sheets, dress, toys, or different things. Scratching can likewise spread the bruises to different parts of the body. Impetigo is brought on by one of two sorts of microscopic organism’s strep (streptococcus) or staph (staphylococcus). Regularly these microscopic organisms enter the body when the skin has as of now been chafed or harmed in view of other skin issues, for example, dermatitis, harm ivy, creepy crawly nibbles, consume, or cuts. Youngsters may get impetigo after they have had a cool or sensitivities that have made the skin under the nose crude. In any case, impetigo can likewise create in totally sound skin. That starts as little red spots, and then changes to rankle that in the long run tear open. The injuries are ordinarily not excruciating, but rather they might be bothersome. That overflows liquid and looks dry. That expansion in size and number. Bruises might be as little as a pimple or bigger than a coin. Increase the use of herbs that have cooling effects on the body like fennel, coriander seeds, Indian gooseberry (amla) and aloe vera. Skin Treatment in Pune provides treatment for acne, Eczema, Hives, Impetigo and all type of skin diseases from skin specialist. Ayurveda has a solitary way to deal with all types of skin break out as this issue shows up because of unevenness of the three doshas — vata, pitta and kapha. In any case, the fundamental driver is the disturbance of the pitta dosha, an Ayurvedic diversion that symbolizes warmth or fire. Pitta dosha shows in the skin and causes collection of warming poisons. These warming poisons collect in profound tissues like rasa (supplement plasma), rakta, (blood), mamsa (muscles) and lasika (lymphatic). These poisons cause tainting of more profound tissues, prompting the state of Yauvanpidika. Since skin inflammation is profound established, utilization of nearby creams, anti-toxins and salves just veils the indications. In this manner, particular Ayurvedic treatment is exhorted which incorporates right eating routine, way of life and some specific natural mixes that handle the infection from its underlying driver. Basic line of treatment for all skin problem is detoxification (dosha nirharan) with help of panchkarma like vamana ,virechana and raktmokshan. Panchakarma is effective in eliminating toxins from the body. It purifies the skin at a very deep level. It helpful in maintaining beautiful skin free of pimples. It helps to reverse the negative effect of daily living. It helps to attain clear and glowing complexion. (Medication initiated emesis): In this treatment, a patient is given inner and outer oleation and fomentation treatments for few days. Once the poisons get melted and accumulate in upper pits of body, the patient is given emetic prescription and decoction. This instigates regurgitating and disposes of poisons from the body tissues. Vaman treatment is particularly suggested fundamentally for kapha-ruled conditions, for example, stoutness, asthma and hyperacidity. (Drug initiated purgation): In virechan, purgation or end of poisons happens through the departure of the insides. In this treatment also, the patient is given inner and outer oleation and fomentation treatments. From that point onward, the patient is given a natural diuretic to encourage clearing of the entrails those aides in purging the assortment of poisons. Virechan treatment is suggested fundamentally for pitta-ruled conditions, for example, herpes zoster, jaundice, colitis, celiac infection and so on. Nasya karma is the best technique for treating Sirorogas (infections influencing the head territory) like headache, incessant cerebral pains, sinusitis, ear, nose and throat issue. This includes the refinement of the head area of the patient. In this procedure, the imbalanced doshas over the neck are evacuated through the nasal openings. Nasal drops are given to the patient as therapeutic oils, sedated powders or churnas, cured juice/drain/restorative vapor. The significance of this Panchakarma method has been determined in the infection of the ear, nose, throat, mental ailments, lethality, epilepsy, cerebral pains, and inconvenient turning gray of hair.